The word 'apothecary' is derived from apotheca, meaning a place where wine, spices and herbs were stored. You will find no wine here for sure! However, the herbs and salads are coming along nicely at this Apothecary. 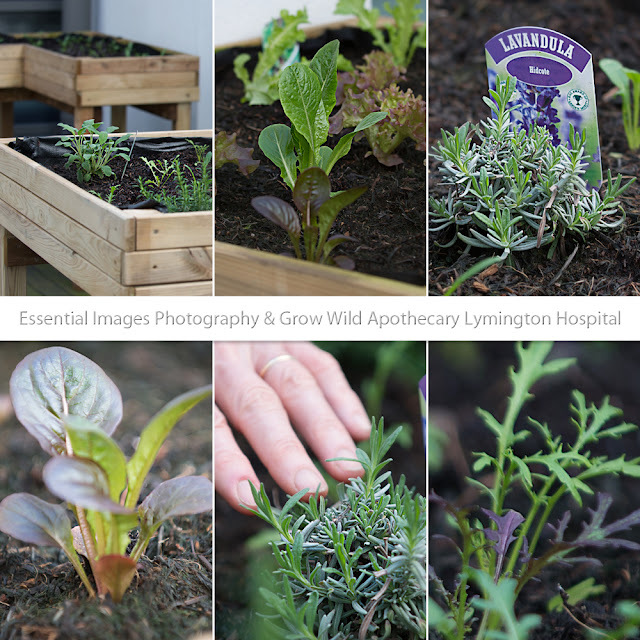 Apparently stroke sufferers gain comfort from plants and this Apothecary is set up to help those in the care of the lovely Lymington Hospital. All thanks to Gill and her wonderful team working on the Grow Wild project. And I hear you saying how can you call hospital 'lovely'? My father in law and mother in law spent time in this hospital and if you have to stay in hospital - this one is 'lovely' and the Grow Wild team are making it even better. If you'd like to get involved in any of the fabulous work Gill and her team are doing - why not GET INVOLVED NOW volunteers and funding is needed to ensure their amazing work continues.